In July 2009, between his departure at Auburn and when he was hired at Texas Tech, Tommy Tuberville was featured in a Birmingham News story as an "amateur stock guru." 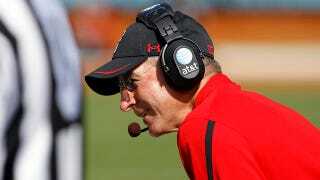 At the time, the article said, Tuberville was brought in to help "drum up a little business for a big-time hedge fund." Now, he's been listed in a federal lawsuit that accuses him and his partner of defrauding investors out of $1.7 million. The complaint, filed Friday afternoon in the in U.S. District Court in Montgomery, claims Tuberville and TS Capital co-founder John David Stroud "employed devices, schemes, and artifices" to commit fraud. Seven plaintiffs from Alabama and Tennessee are seeking damages against the Auburn-based investment company. The 32-page suit alleges that Tuberville and Stroud mixed their clients' assets with their own, failed to file tax returns, falsified client statements, falsified fund performance reports and "generally disregarded and violated customary practices and procedures followed in the hedge fund and security investments industry." Several plaintiffs, including at least one former employee of TS Capital, have demanded their money be returned, yet, according to the complaint, none of the money invested has been accounted for. The suit also states that investors listed "have reason to believe that most, and possibly all, of their invested funds have been misappropriated, improperly converted and/or squandered."